We are bringing this live page to a close after today's memorial service at St Paul's Catherdral - six months after the fire at Grenfell Tower. Thank you for following our updates. You can read the story of how the event unfolded by clicking here. Maria Jafari, who lost her father in the fire, told the Press Association: "It's very, very hard. Still she (my mother) cries, every day, every second when we are talking about our father, all the memories come out again. It's six months and it's still very hard for us. "I wish nobody could have this in the whole life, in the whole world, I wish nobody would have to go through all these things." Clarrie Mendy, who came up with the idea of holding a national memorial service, says the government needs to "step up". Maria Jafari, 38, and her family met Prince Harry at the end of the service. Harry told her mother, Fatima Jafari, 78, that she must have been very proud of her daughter, who addressed the congregation. He congratulated her for taking part. Mrs Jafari began sobbing as she remembered her husband, who was 82 when he died. The prince asked an interpreter: "Just tell her I am so incredibly sorry for her loss." Labour MP David Lammy, whose friend died in the fire, says he has written to Theresa May about the public inquiry. He said he had urged her to make sure that those in power are held to account, as there is still distrust from survivors and bereaved families. Mr Lammy also called for a panel of advisers to be appointed to help the chairman of the inquiry, Sir Martin Moore-Bick, and warned that it "must leave no stone unturned". The service has now ended and the Royal family have left. But relatives of the victims and some of the survivors remain. 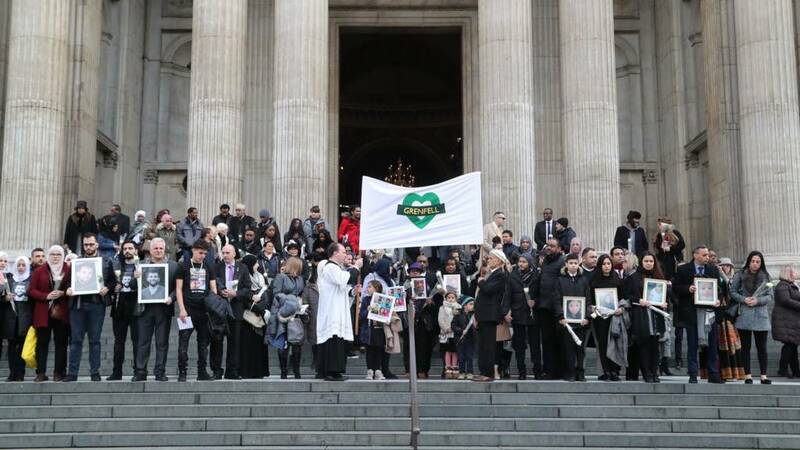 They are now gathering on the steps of St Paul's with pictures of those who died. The specially made Grenfell banner, featuring a green heart, will be kept for future remembrance services. The banner, designed to look like a London Underground sign, will be displayed during the the monthly vigils held by the community, which happens on the 14th of every month. The Royal family members are now moving on to meet some of the families affected by the fire and those who lost loved ones. The names of the 71 people who died in the Grenfell Tower fire. In July, the BBC pieced together a picture of what happened as the fire took hold on 14 June. The timeline uses interviews with survivors, witnesses and relatives of the missing, as well as video footage, gathered on the night and in the immediate aftermath. Every person’s recollection of a traumatic event is unique, and memory can sometimes be unreliable but the story gives an insight into what people in Grenfell Tower faced that night. School children scatter green paper hearts as the choir sings Somewhere from the musical West Side Story. For many survivors, the image has become a symbol for the tragedy. A total of 395 households were affected by the Grenfell Tower fire, according to the BBC's social affairs correspondent Michael Buchanan. Focusing purely on Grenfell Tower and Grenfell Walk, 196 households were accepted as homeless after the tragedy. As of 30 September, 132 households with 261 children were living in temporary accommodation and 109 of those households, including 210 children, were in hotels.